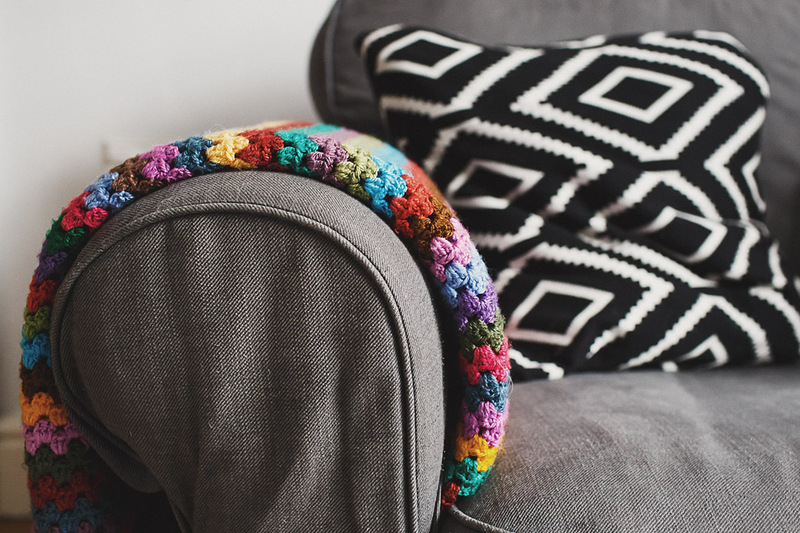 For any of you wanting to learn to crochet – here’s my pick for a brilliant starter project to get you off the blocks – it’s a super-simple pattern, looks ace and is perfect for beginner crocheters! It’s from the wonderful Attic24 blog – a great crochet resource with loads of amazing patterns and ideas. This blanket was one of the first items I ever made and I still love it now. It lives in our campervan and is perfect for cuddling up under on a chilly night! I love to crochet. It was never really on my radar until I met my sister-in-law, who is brilliant at it. After months of seeing her churn out amazing blankets and countless other beautiful things, I decided I really wanted to learn too. Then I spotted this amazing blanket by Sandra Juto on Pinterest, and the notion that maybe one distant day I might be able to make something remotely similar was the final persuasion I needed. I taught myself how to crochet a few years ago using Mikey’s YouTube videos (NB he uses US stitches – see tip 1 below) – there are LOADS of them and it’s by far the easiest way to learn as it’s hard sometimes to visualise how to do it from written instructions. I’m a bit sporadic with it but do try to always have a project on the go. My friend Michelle has now also caught the crochet bug, so now I have a crochet buddy! It’s pretty dorky but we have started having ‘crochet club’ nights where we sit together on the sofa, work on whatever crochet projects we’ve got going on, rabbit away and drink tea (get pissed). It’s really relaxing and therapeutic, and it’s sooo satisfying when you finally finish something, particularly something new you’ve never made before. So many people look at crocheted stuff and say, “Oh, I could never make that,” but honestly, it’s really easy and surprisingly quick to pick up. You don’t even need to be particularly creative, as there are so many wonderful patterns out there that there’s no need to have to create your own designs if you don’t want to. It’s also ridiculously simple and cheap to set yourself up kit-wise. 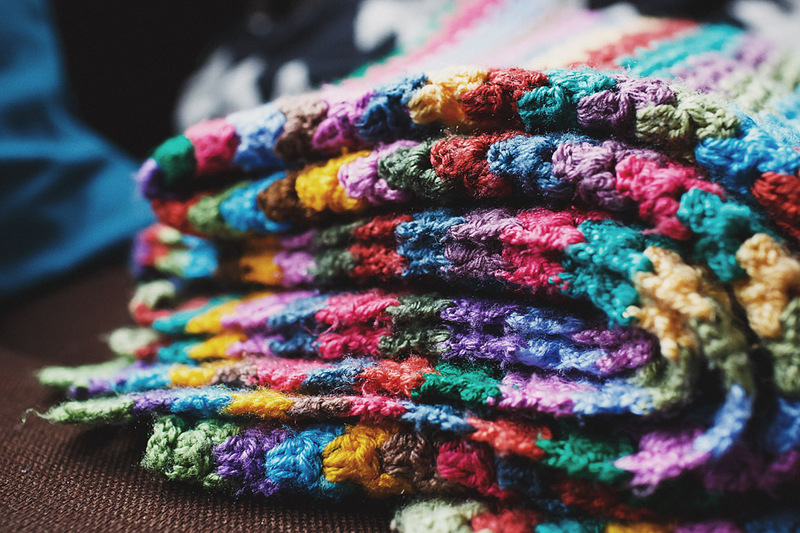 All you need to complete a small project is a minimum of a crochet hook, a tapestry needle and a ball of yarn. You can buy all of these things for less than a tenner, possibly even less than a fiver. Obviously it’s possible to buy really beautiful, expensive yarns, but you can create some really lovely things using just bog-standard acrylic yarn, which is cheap as chips and widely available. I used different colours to the pattern, I just picked around 12 different colours I liked of basic acrylic wool, but you can just choose whatever colours you like – it doesn’t matter at all. FOLLOW THE ATTIC24 GRANNY STRIPE BLANKET TUTORIAL HERE! I really hope this helps if you want to start learning to crochet, or if you’re already doing it but fancy a nice easy new project. Please do let me know if you make one, I’d love to see it! Do any of you have any super-simple crochet patterns / projects that would be great for beginners? I wanted to learn to crochet for aaages before I actually did learn, it always seemed far too complicated but it is SO easy! I’ve made all sorts now including a stuffed unicorn and baby booties. 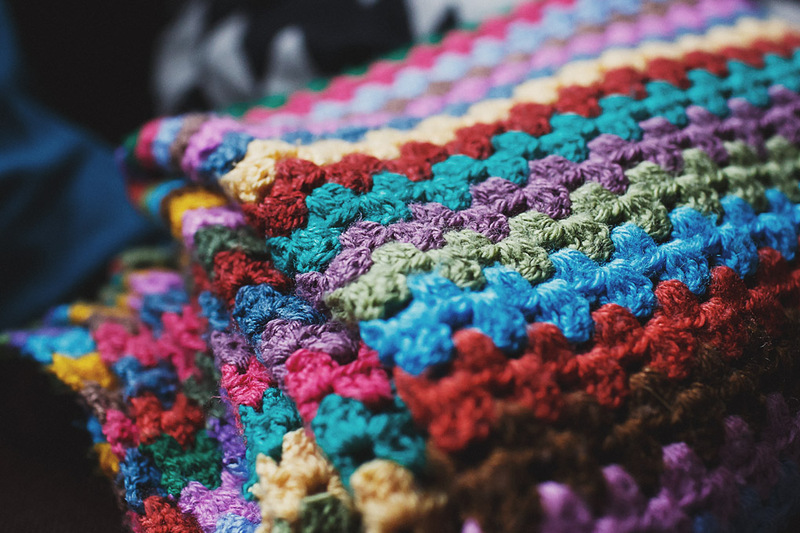 I want to start on a new blanket, the one you linked to by Sandra Juto is really inspiring! I love the colours in yours. Thanks Emma! Like you say, it really isn’t as hard as it looks. I made a right pigs ear of the first couple of things that I tried to make, but then it does just click and you’re away! I’ve been trying out various YouTube links to learn how to crochet. I’ll give Mikey’s videos a try. He’s really funny! But very clear and helpful. Do remember though that he uses US stitches, so remember to use the conversion chart.